This picture reveals the original state of the garden house, uhm shed, that we took over from the previous owner. In the summer of 2011, when we had kick-started at least a part of the garden, it was time to renovate the house. We had to wait some months and then we did not receive a permit from the municipal authority to build a new house. 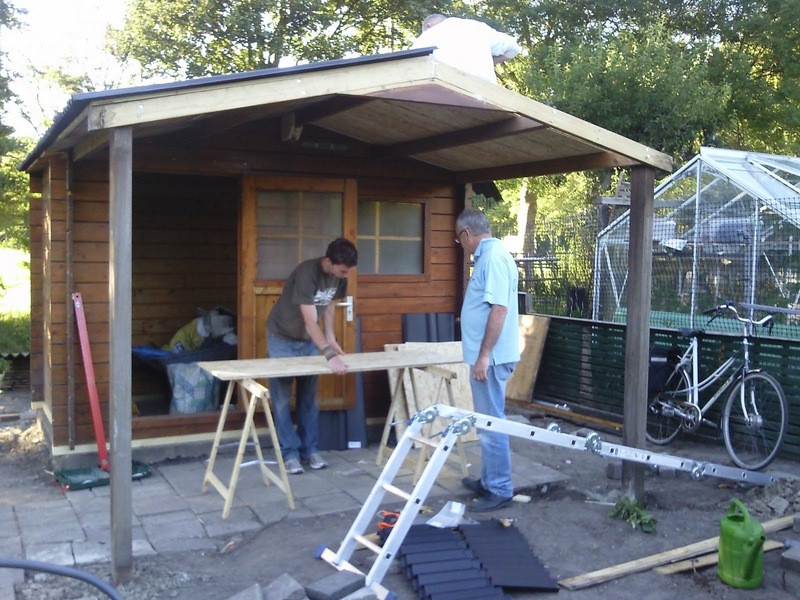 Therefore, we bought a second-hand garden house in Brabant and used it together with the existing material to upgrade the house on the existing foundation. This second house already had a ready-made porch which we could place in front of the house (after breaking it down to transport it, and build it up again). Unfortunately, the roof was in bad condition and couldn't make it to the other side of the great rivers, so a waterproof roof had to be placed anew. We also included a larger window in the left wall for more light, and replaced the plastic windows with glass ones. A following step was to measure and saw the remaining timbers to make the second half of the house. The back part was then divided in two: one as a shed for tools and the other half would be transformed into a little kitchen. To finish the outside of the house, we painted it to protect the old wood against climatic influences. At last we added rain water pipes and connected it to our 1000 liter water tank. Then it was time to finish the inside of the house. It was painted in bright - what turned out to be quite psychedelic - colours. With the many windows it was now really a fine little house, instead of a shed. The kitchen also became just perfect; light, cosy and everything that is needed to make a nice meal, fresh from the garden. We collect the drinking water from a central tap about 300 meters away, which allows for quite a workout when carrying a full can. The water outlet from the sink is filtered in sand at the back of the house, from where it drains back into the soil. Special thanks goes to Karel, Thea, René and Piet, who spent many days of work to make this all happen.